Today we’re talking about my beloved brown rice. As an athlete, I consume a ridiculous amount of brown rice; it’s an important source of proteins, complex carbs, precious fiber and many important nutrients and minerals. Brown rice is awesome and you’re getting nothing but goodness in every spoonful. I was contented with my brown rice, until one day my colleague Sohyoung told me that you can even get more out of it. She said that if you soak brown rice at room temperature overnight, the rice will germinate and get even more awesome. I wasn't convinced, so I looked into that and found out that Sohyoung was right all along. Sprouted (or germinated) brown rice is the way go! 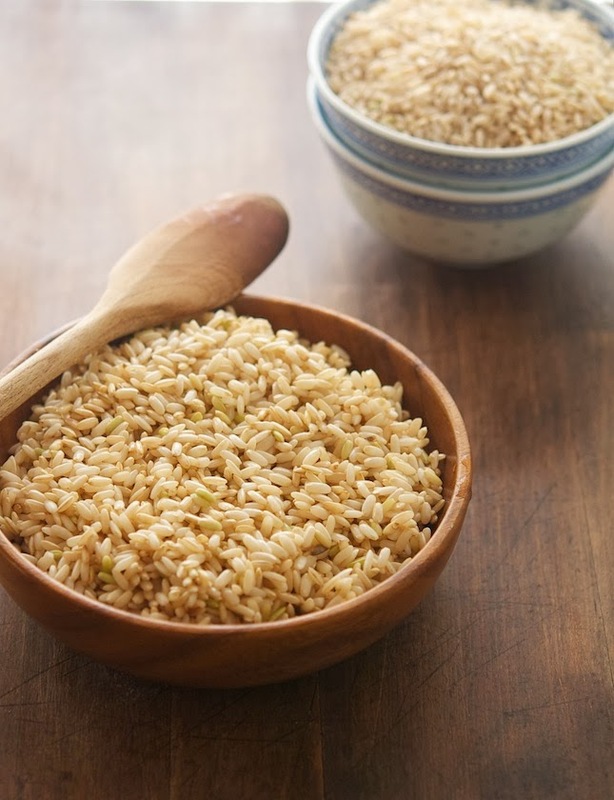 A team of Japanese scientists found that inducing brown rice to germinate enhances its already high nutritional value. 3. Ten times the amount of GABA (gamma-aminobutyric acid) which is knows to improve kidney function. 4. Rice sprouts contain an enzyme called protylendopetidase which is a potent inhibitor implicated in fighting Alzheimer’s disease. once to supply the best nutrition to the growing sprout," explained Hiroshi Kayahara, Ph.D., the lead investigator on the project, and a biochemist from Shinshu University in Nagano, Japan. Are you on board? Yeah? Good. Making germinated brown rice is easy. You only need brown rice, water and time. Here's how to make it happen. Germinated Brown Rice Print this recipe! Note. White rice doesn't germinate, it’s only brown rice that works the magic. 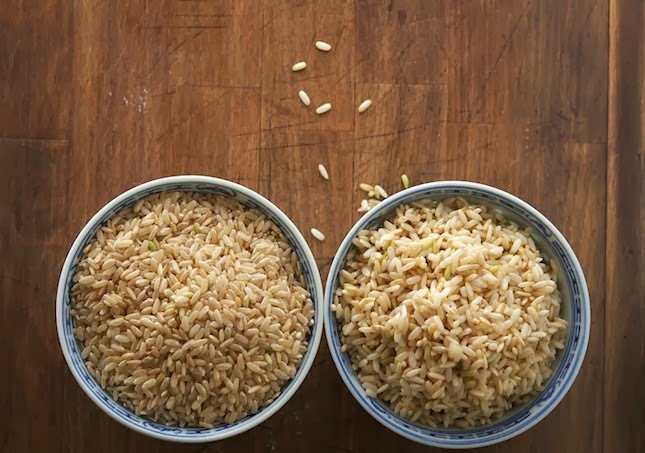 Place brown rice in a bowl and cover with water, using exactly twice as much water as rice. layer softens, and the rice starts absorbing the water. You will notice that little sprouts will pop-out (tiny buds less than 1/16 of an inch tall). Room temperature varies between seasons (I know, duh! ), when it's warm outside the water will be at an average lukewarm temperature — perfect for germination purposes. During the colder months it's better to place the bowl closer to a heater. Germinated brown rice cooks much faster, but if you prefer to leave as much of the active enzymes intact, cook at the lowest temperature you can get away with. It will also have a sweeter flavor because the liberated enzymes break down some of the sugars and proteins. 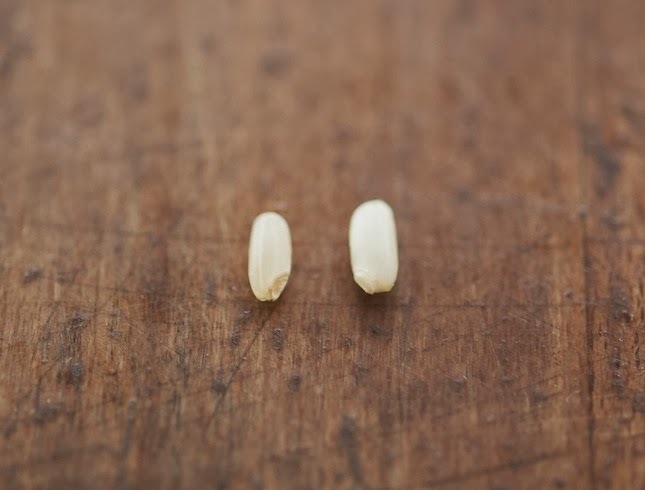 Germinated brown rice is a lot softer than regular brown rice — almost as soft as white rice, but a lot more fibrous and nutrition. However, you may come across a strange odor; this happens because sprouting attracts friendly bacteria. The bacteria’s waste product is what gives it the weird odor. If you wish to eliminate the odor soak the rice in green tea. Green tea is highly antibacterial, and since the friendly bacteria are unable to grow, there will be no foul smell. Make a large batch of green tea, let it cool until it reaches room temperature and then soak the brown rice in it. Great. Now I want rice. Super interesting, I want to try this! I am soaking some brown rice as soon as I finish writing this. GREAT info and tips. Thanks. How did you cook it? Do you need less water when they're soaked ahead of time? Can I use a rice cooker or will it turn into mush? WOW!! who knew. I've been eating brown rice like there is no tomorrow - had no idea I could sprout it. I've been sprouting all kinds of legumes. This is so cool ! Mine soaked all night and now it's ready to go for lunch! This is so cool! I have been soaking mine in apparently too much green tea, about 4 cups green tea to 1 cup rice, for about 6 hours so far. We'll see how it comes out. I've bookmarked this so I'll try to update tomorrow. I'm really excited!! It's a colder climate right now here in Montana. So excited that my 2 batches of Lundgren Organic Short Grain Brown Rice is now starting to sprout. I began a warm water soak on Saturday PM for 48 hours and then the 2 to 3 rinse repeats daily. It's now Thursday AM and now seeing little shoots. Do you use green tea from the beginning or only at the end after germination? Soaking in green tea?!?!? What a great idea!